I sat down to read Jessica Handler’s book with a bit of a tourist mentality and a touch of relief, glad that grief and loss weren’t currently on my writing agenda. This would be interesting, like reading a book about sports writing. After all, I wasn’t mourning anyone’s death. I’ve been a fan of Handler’s work since reading Invisible Sisters, an expertly crafted memoir about the loss of her two sisters. That book—full of research, flips back and forward in time, deep description, and insight—was written with such even-handed precision and beauty that I knew Handler would have excellent advice about the daunting challenge of turning emotion and experience into rich text. And…it’s probably obvious that I was wrong about grief and loss (or maybe I was in denial). By the time I finished reading Braving the Fire (St. Martin’s Griffin, 2013,) I had several pages of notes for my current writing project. Handler’s prompts and incisive questions opened up a problem identified by my readers that I hadn’t been able to find a way into. She also called me out—gently, but directly—on exactly something I’d been doing throughout my draft: overwriting and over-analogizing in the places where I was uncomfortable. Her book urged me to look at those overwritten and overly built spots on the pages not as places where I’d committed bad writing but as places where I was scared and put up walls. And she was exactly right. Braving the Fire is not a lonely excursion into the tough stuff. Handler welcomes writers of all stages immediately into the community of writers, offering encouragement toward the act of stringing words together. Yet she deftly sidesteps the tired disparagement of “writing as therapy,” a tag used by critics to separate out what is seen as literary from what is not in life writing. While this binary sometimes serves as a reminder about the goals of aesthetic quality and the writer-reader relationship, the intended or unintended effect of such an epithet is to close the door on the writing process itself, which often begins with venting and journaling, only to be transformed through craft and attention into a text that brings value to the reader. Handler sidesteps this potential divide by inviting readers to examine literary approaches to grief and loss. She immediately introducing scores of literary references, quotes, and examples from authors including Robin Hemley, James Agee, Joan Didion, Lee Martin, C.S. Lewis, Dinty W. Moore, Rebecca McClanahan, Karen Salyer McElmurray, Natasha Tretheway, Abigail Thomas, and many others. The effect is one of welcoming a writer of any stage into this daunting task and inviting them to stand shoulder to shoulder with many who have taken on the same challenge. Handler places the potential reader of one’s words at the end of this trek, another concrete strategy and essential orientation that decreases the loneliness of the writing task and emphasizes the value of community. One of Handler’s consistent points, at a structural level, is the question of what rewards a reader might gain in reading a particular work, whether these rewards might be insights, moments of beauty, or a narrative with forward motion. 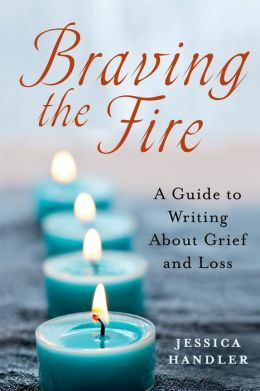 The chapters are grouped in sections around Kübler-Ross’s five stages of grief, but Handler stresses that the experience of grief does not occur in neat stair-steps. These stages in Handler’s framework each match up with several craft issues: for example, the stage of “Bargaining” introduces advice about using research, artifacts, and structural elements such as alternating points of view to excavate material and build a draft. In the “Anger” section, she includes one of the clearest descriptions of voice I’ve ever read, an understanding enacted in this book itself, which has a double-voiced harmony of compassionate friend and skilled writer who will not hold back on every piece of writing wisdom and reference she can bring to the task. Another subheading within the “Anger” section is “Your Plot Is Probably Not What You Think It Is,” just one example of the directness that will make this book useful to many readers. At every stage Handler includes sections entitled “My Story” with her life experiences and also her writing process, creating a narrator-presence throughout the book and adding an engaging and insightful layer of memoir to this essential guide. Readers and writers of all levels have much to gain in writing and re-seeing their work with this book as companion. Sonya Huber is the author of two books of creative nonfiction, Opa Nobody and Cover Me: A Health Insurance Memoir, and a textbook, The Backwards Research Guide for Writers: Using Your Life for Reflection, Connection, and Inspiration. Her work has appeared in Creative Nonfiction, Fourth Genre, The Crab Orchard Review, Terrain.org, and other journals. She teaches at Fairfield University and in Fairfield’s Low-Residency MFA Program. A great review of an excellent book. Yes, Braving the Fire’s “double-voiced harmony” and “narrator-presence” keep this work and a writer’s use of it from being lonely excursions.Thank you, Jessica Handler ( and Sonya Huber), especially for the reminders to see and re-see evidence of the impetus to exit the premises when the content is difficult.